Combine chops and marinade in shallow pan; let stand for 1 to 2 hours in refrigerator, turning occasionally. Remove about 1/2-inch from bottom of asparagus spears, or until only tender stalk remains. Blanch in boiling water for 2 to 3 minutes; cool in ice water. Cut into 1/2-inch pieces and place in mixing bowl. Remove tops and very bottom of leek; cut in half lengthwise. Remove yellow center and rinse thoroughly with water. Grill over hot charcoal for 2 to 3 minutes per side, being careful to avoid burning. Cut into matchstick-size pieces (julienne) and add to bowl. Stir in remaining ingredients and mix well. Set aside to chill. Cook pilaf according to package directions. Add remaining ingredients to hot pilaf and mix together. Keep hot. Remove chops from marinade. Discard used marinade and grill chops over high heat for 5 to 6 minutes per side, turning a quarter turn halfway through each side, until done (145°F | 162.7°C for medium rare). Spoon 1/3 cup pilaf onto each serving plate. 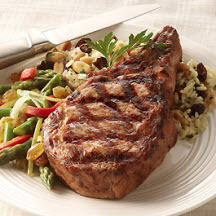 Arrange grilled veal chop on top and add 1/2 cup salad on top of that. Serve immediately. Nutritional Information Per Serving (1/6 of recipe): Calories: 440; Total Fat: 15g; Saturated Fat: 3g; Cholesterol: 90mg; Total Carbs: 49g; Fiber: 4g; Sugar: 24g; Protein: 31g; Sodium: 370mg; Potassium: 1004mg.